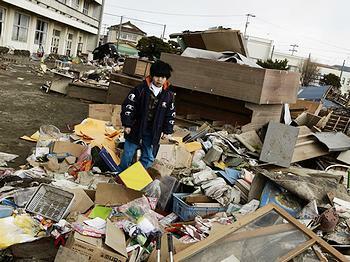 TOKYO, Japan, April 7, 2011 (ENS) – Japan was shaken by a severe magnitude 7.1 earthquake Thursday night off the northeastern coast of Honshu island, the same area struck March 11 by the worst earthquake and tsunami in the history of this quake-prone island chain. Hundreds of earthquakes and aftershocks have rattled the region since March 11, but none have been stronger than 7.0. Residents in Miyagi, Fukushima, Ibaraki, Aomori and Iwate prefectures were told to evacuate to escape a tsunami wave that could be as high as two meters (6.5 feet), officials said. The warning was lifted about 80 minutes after it was issued. Some 100 people were reported injured in the temblor, and a fire and gas leaks were reported. The power supply to the city of Sendai was interrupted. Thursday’s quake was centered 40 kilometers (25 miles) below the sea floor off the Honshu coast about 66 kilometers (41 miles) from Sendai, a port city flattened by the March 11 quake. 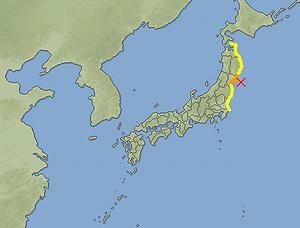 This quake was felt in Tokyo about 330 km (205 miles) from the epicenter, where buildings shook for at least one minute. It was located 116 km (72 miles) from Fukushima, where Tokyo Electric Power Company has been struggling to contain radioactivity from six reactors at the Fukushima Daiichi nuclear power plant damaged in the March 11 disaster. 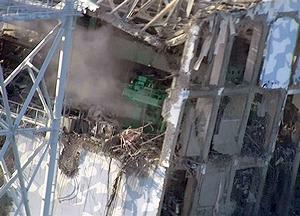 TEPCO said Thursday’s quake has created no additional problems at the nuclear plant. Coolant water injections are continuing in an attempt to cover nuclear fuel that was exposed when power to the plant was cut off during the March 11 quake and resulting tsunami. TEPCO says no abnormality has been detected in radiation levels at Fukushima Daiichi plant after this latest quake, but radiation levels in air, soil and sea water near the plant have been so high as to be immeasurable in the past week. TEPCO estimates that 70 percent of the fuel rods in the Unit 1 reactor core have been damaged, compared with 30 percent fuel damage in the Unit 2 and 25 percent in the Unit 3 reactor cores. Hydrogen explosions occurred at Unit 1, 3 and 4 reactors in the four days following the March 11 earthquake and tsunami, damaging the buildings at the nuclear power station and releasing radiation. A new operation to reduce the risk of a fourth hydrogen explosion by injecting nitrogen into the Unit 1 reactor has gone well, TEPCO said Thursday. Pressure in the reactor’s containment vessel increased since injection started early Thursday morning, showing that the operation has been successful. Injection of chemically stable nitrogen is intended to displace oxygen inside the Unit 1 reactor containment vessel, thereby reducing a risk of explosion due to the combustible combination of hydrogen and oxygen, according to the International Atomic Energy Agency. On Wednesday, the company successfully stopped leakage of highly radioactive water into the Pacific Ocean from a cracked concrete pit and says it plans to build barriers of steel and sandbags to contain the radioactive sea water. Meanwhile, TEPCO is continuing to dump water contaminated with low-level radiation into the Pacific to make room for the storage of highly radioactive water that has been hindering restoration work at the plant. The operation to release water contaminated with low-level radiation will be completed on Saturday, said the Japan Nuclear and Industrial Safety Agency.